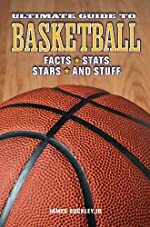 Book Trends: Young Adult and Children Book Reviews: Book Review: Ultimate Guide to Basketball by James Buckley, Jr.
Book Review: Ultimate Guide to Basketball by James Buckley, Jr.
Review: Do you like basketball or do you just like to learn new facts? If so, The Ultimate Guide to Basketball is the book for you. I'll guarantee you'll enjoy this book. You'll get addicted to this book just as I did. Let me give you an overview of The Ultimate Guide to Basketball by James Buckley, Jr. In The Ultimate Guide to Basketball, the facts are organized with each player. Action pictures are provided with each of the numerous players' description. Your more well-known players are included in the encyclopedia of facts, like LeBron James of the Cavaliers, Kobe Bryant of the Los Angeles Lakers, and Wilt Chamberlain of the Wizards. However, "quieter" players like Julius Hodges of the Denver Nuggets are also included. New stats, like MVP titles, are used to see how good players really are. In The Ultimate Guide to Basketball, new and amazing facts are disclosed. Get your basketball info now! James Buckley, Jr. does a great job of informing the reader of truly how good a player really is. You'd be surprised by some of the new information that you'll learn when you read this book. I love the way that James Buckley, Jr. mixes in the "quieter" players with some of the players that most people recognize like Michael Jordan and Kobe Bryant. You'd really be surprised to learn that some of the not-so-famous players are as good as or better than some of the more famous ones that you hear about in newspapers or television. The Ultimate Guide to Basketball gives you the inside information to hundreds of players like Wilt Chamberlain, Michael Jordan, Kobe Bryant, Julius Hodges, Tyson Chandler, Eddy Curry, Ray Allen, and Allen Iverson. I think this is one of the most informing books that I've ever read. I'd highly recommend it for any age level. I rate it 5 out of 5 stars. We would like to thank Raab Associates, Inc. for providing a copy of Ultimate Guide to Basketball for this review. Have you read Ultimate Guide to Basketball? How would you rate it? If you want to know the basics and fundamental of basketball, you should read the book. It can help you in a lot of ways.